For our November issue, Curtis walks us through the steps of turning a custom chisel handle. If you’ve got a favorite chisel that you want to make even better, this is a great solution and a fun turning project for just about any level of woodturner. 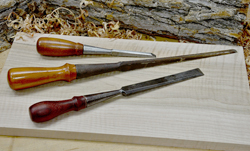 Want to turn your own custom chisel handles? Take a look at Curtis Turner’s article for all the information you will need to get started! You are going to think I am making this up but a good way to secure the finished socket to the chisel is with hairspray according to none other than Chris Schwartz and Thomas Lie-Nielson. Check this out. Check out The Highland Woodturner November Issue The Rikon Bandsaw Giveaway: Interview with the Winner!